UPDATE! Speculation no more – this release was actually revealed a month ago by RightStufAnime.com. Pre-order your copy today and enjoy it in June! Special thanks to @Soundout12 on Twitter for catching us up. If you’re a Garo fan living in the west, and you’ve been itching for some more content we’ve got some excellent news for you. It seems that Garo: Demon Beast of the Midnight Sun may have been confirmed for a western release thanks to a tentative pre-order link that popped up on Amazon. 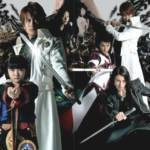 While the link may seem a little unusual, we have seen Shout Factory’s Super Sentai DVD releases confirmed via this method and animenewsnetwork has confirmed as such. Garo: Special Demon Beast of the Midnight Sun will be released June 26th 2018 at least according to the Amazon link. Garo Special: Demon Beast of the Midnight Sun first aired in Japan on December 15th 2006 as a direct to TV movie. It was set after of the first Garo series, Kouga Saezima sets out to the northern district upon reassignment. While hunting down Horrors, a young priestess named Rin informs Kouga that she has been sent by Priest Amon to save a presumed dead friend in the Makai realm within Kantai, Jabi. Kouga teams up with Rin in a quest to save Jabi as they are hindered by supernatural and Makai forces alike. Meanwhile, somewhere in Japan, the dark Horror Lord Legules was resurrected and plots a means to alter a supernatural event called Midnight Sun within Kantai to plunge the world into darkness with his family.